I've decided to sign up for a couple of reading challenges this year. First, Mount TBR, hosted by My Reader's Block, because I have a lot of books that I've bought but haven't got around to reading yet, and I really want to make some progress on the stack this year. I've decided to sign up for Mont Blanc, which is 24 books that I already own. This doesn't sound particularly challenging but it's twice as many as I managed last year, so it seems a reasonable number to aim for! I'm including Kindle books that I paid for, but not free ones. 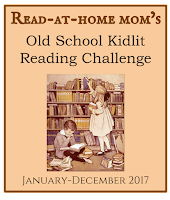 I've also discovered the Old School Kidlit reading challenge hosted by Read-at-Home Mom. This sounds very much my sort of thing, so I decided to participate. The idea is to read classic or older children's books, with monthly themes; January's theme is Award Winners, and I will probably be reading either The Little White Horse by Elizabeth Goudge or The Circus is Coming by Noel Streatfeild, both of which have won the Carnegie award, and both are currently sitting unread on my shelf, so this will also help my progress towards Mount TBR. Besides these challenges, I'm also going to try to read one book from my Classics Club list, one non-fiction book and one re-read per month. I'm not sure how long this will last, but I'd like to aim for it! This month I'm reading The Two Towers for the Classics Club, L is for Lifestyle by Ruth Valerio for non-fiction (although I have several other non-fiction books on the go which may or may not be finished this month), and I've just finished re-reading Raider's Tide by Maggie Prince, which I recently got the sequel to but realised that I remembered very little about this book! I enjoyed it just as much this time around, and am looking forward to reading the next book, North Side of the Tree. 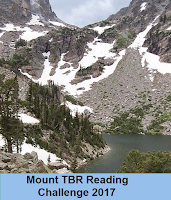 I'm doing the Mount TBR challenge too! I'm going for 12 books, not 24, but you never know, I might get more ambitious later this year and aim higher :-) Good luck!